Eden Hazard: I wouldn't have got a touch even if we played for three hours. 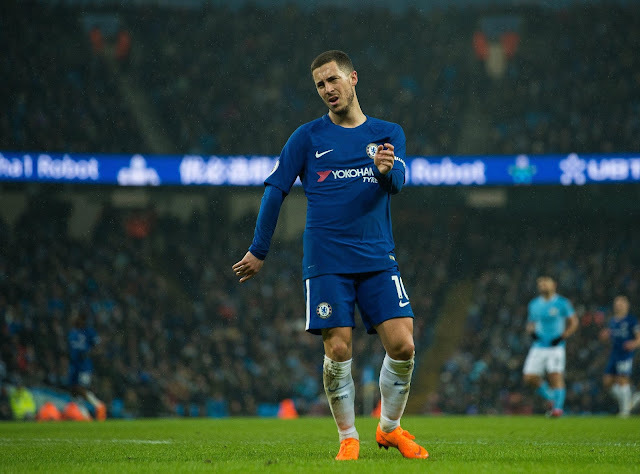 Eden Hazard, as expected, has given his opinion of the decision to play with a false-nine formation against Manchester City. Surely now, after Antonio Conte looks back at the game, he will understand that we need to bin this formation for the remainder of the season. Against Huddersfield (no disrespect) it worked because they would not have faced a side playing that way before. To try and use it to same effect against Pep Guardiola’s Manchester City side was totally wrong. "I wouldn't have got a touch even if we played for three hours, even if we improved in the last 10 or 15 minutes. We were better with the ball, but we needed to do that during the whole match. For me personally, it's hard to play well if you only get the ball three times. But, when we got the ball, we had to use it better - we made the wrong choices. I was trying to jump, but it's not easy to win duels against Nicolas Otamendi and Aymeric Laporte. We didn't play to our strengths today. If Morata or Giroud played, it would have been easier to play with long balls. I did my best. Conte put me up front, I tried to do my maximum, but I don't think we played a good match. We have had opportunities against Barcelona, but nothing at all today. It was difficult, especially to get out of their pressing. If you have the ball, you immediately have three, four men on your skin. We also missed easy passes. We did not play a good game collectively, but we are going to work hard to do better next week." – Source: Football London. It’s performances like Sunday that will convince the Belgian to leave if Real Madrid come calling and we simply cannot afford for that to happen. You have to play your best players in their favoured positions to have the maximum impact in the game and on Sunday we did not give him a platform to perform. I expected Antonio Conte to adopt the 3-5-1-1 formation for Barcelona and for Manchester City but that never happened. At least against Barcelona we managed to create chances going forward and had the attacking threat we were looking for. As I have said to re-iterate on record, I have no issues with our defence approach in both games at all as I could see the game-plan. It’s what you are then to do going forward that matters with there being a distinctive difference in both games. I would like us to approach Barcelona next week in the same way we did away at Atletico with Hazard playing in behind Alvaro Morata. We would have a three-man midfield and a solid foundation in behind Hazard to enable him to hunt the ball down to then go forward, to play and influence the game as much as possible. If, and it is a big if now, we are to make a realistic challenge for the top four then we MUST play Eden Hazard where he can hurt the opposition the most, play him where HE WANTS to play and build the rest of the starting eleven and formation around him.